A Liger is a cross between a male lion and a female tiger. Probably never happening in the wild, this event does occasionally occur in captivity. One such creature lives in California, forty minutes outside of Los Angeles at Shambala Preserve. Because of the unique physiology of male lions and female tigers, ligers often end up much larger than both parents. The converse is true of tigons (offspring of male tigers and female lions). Ligers usually have the mane of the lion as well as the stripes of the tiger. Unlike lions, but like tigers, they often go swimming in the water. The liger at Shambala Preserve came to the park in 1998 from a zoo in Illinois. Ironically this is not the first hybrid they've had, but the third. 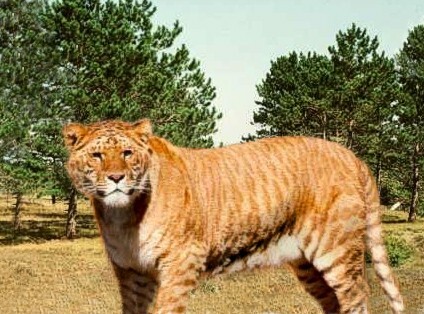 Their first was a female tigon, born in 1978. This tigon had an offspring with a male tiger, informally called a ti-tigon in 1983. Both sadly passed away of cancer. The current liger at the zoo is called Patrick. Tours are only available at certain times. Check with Shambala Preserve. UPDATE from one our readers: Patrick the liger has passed away. However, there are two juvenile ligers up here in Northern California at the Barry R. Kirshner Wildlife Foundation near Chico, California. This wildlife preserve is now open the public and the Ligers are MAGNIFICENT! Maya is over 300 lbs already (she may grow to over 2,000 lbs) and still playful like a young cub. I forget the name of the other liger.